A whole new look. Same great content. 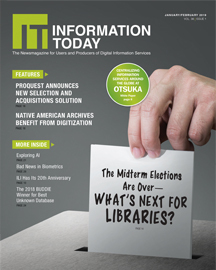 Information Today, the publication preferred by librarians of all types, will have a new and exciting look starting with the January/February 2019 issue. The new Information Today design will have the familiar look and feel of our other popular library publications, Computers in Libraries and Online Searcher. Click here to subscribe for just $11 an issue. African-American people of accomplishment are often underrepresented in history sources. Recent movies such as Red Tails and Hidden Figures put an exclamation point on that gap. Julieanna L. Richardson was keenly aware of this, and she set out decades ago to do something about it. Nature published a multi-authored article, "Scientists Despair as US Government Shutdown Drags On." It notes that the shutdown's "effects on science have begun to compound, leaving many government researchers weary, worried and demoralized." Clarivate Analytics announced that it has entered into a definitive agreement to merge with the Churchill Capital Corp public investment vehicle. The Association of Research Libraries (ARL) announced that Fair Use/Fair Dealing Week 2019 will be held from Feb. 25 to March 1. The Library Corp. (TLC) upgraded its Library-Solution to version 5.4.1. According to TLC, "This new release includes many features in the ILS, most noteworthy the ease of use with batch editing in cataloging." Springer Nature partnered with the Knowledge Media Institute (KMi) of The Open University to launch a comprehensive Computer Science Ontology (CSO), which is the largest taxonomy of research topics in computer science available. 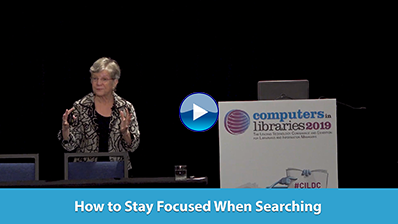 In a Campus Technology article from Dec. 12, 2018, Dian Schaffhauser reports that according to statistics from the U.S. Department of Education, "library collections in higher education now contain more digital items than physical." Let's take a look at what academic library staffers have to say about the state of ebooks in their libraries today.